A buffet lunch and beverages will be served at the Lambda Chi house beginning at 2 p.m. with a brief awards program to follow. It Is Time to Apply! Download the form today and follow the instructions. Alpha Phi Zeta believes that scholarship among the brothers is key to their future success. To that end, we are pleased to offer scholarships that are selected only from active members in good standing that apply. The 2018 Scholarship Application window is now open. All applications must be submitted by September 25, 2018. If you are an active brother of Alpha Phi Zeta, you may download the Scholarship Application to apply. Congratulations to Alpha Phi Zeta brother Ross D’Entremont for his selection for the Cyril F. “Duke” Flad award. This is the highest award for an undergraduate member at the national level. 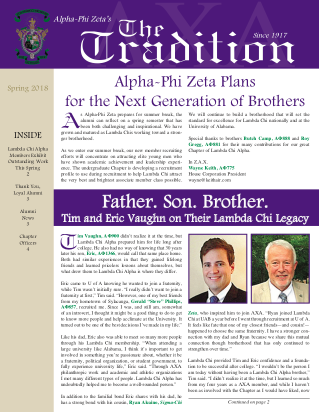 This is one of the highest honors an undergraduate member of Lambda Chi Alpha can receive, and it is given to a young man annually who has demonstrated leadership and passion for his Fraternity, his campus, and his community. A committee of former Flad Award recipients reviewed Ross’ nomination, considering and evaluating his achievements leading to his selection. Congratulations to Alpha Phi Zeta’s own for the prestigious recognition!